These are things that the Table Rock Historical Society has on the Fisher family. There was a Civil War veteran who belonged to the local G.A.R. post. There was a Chester Fisher who played drum in a local Czech band. 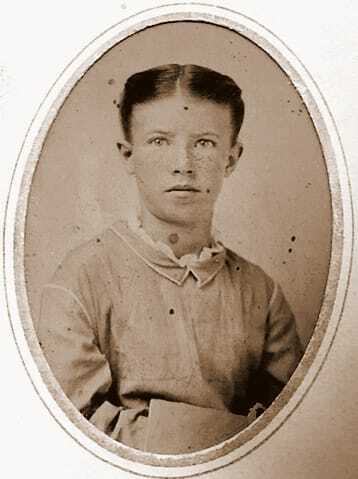 There was a young girl named Imo; she died as a child and is reportedly buried in Wilsonville, Nebraska but her portrait was donated to the Table Rock Historical Society. We don't yet know how they all tie in, but here is what we have. 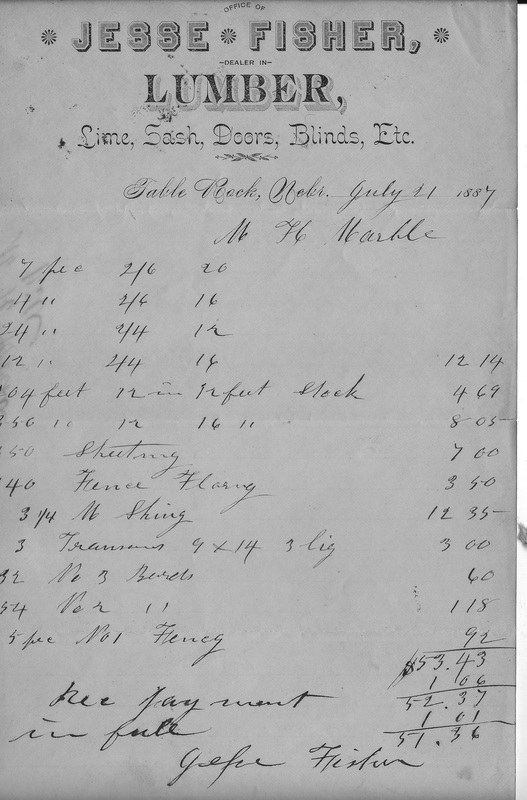 1885 - J. L. Fisher joins the G.A.R. Table Rock's G.A.R. post was formed in 1883, Post 165. Records were kept, but are scant. The name of J. L. Fisher appears, presumably Jesse Fisher. 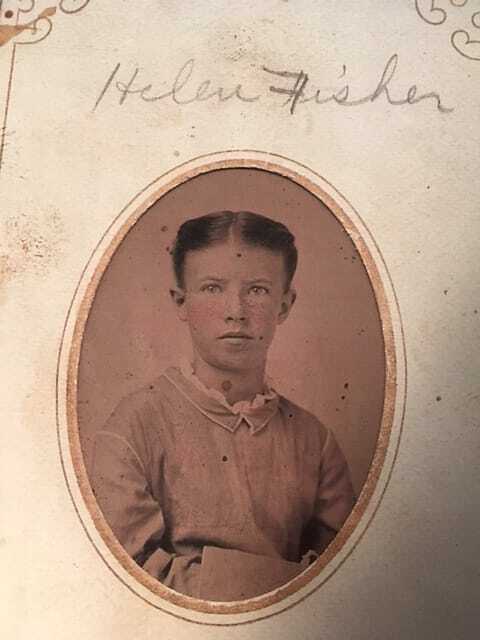 For example, the report for the 3rd quarter of 1885 added as a member, "J. L. Fisher, age 45, Illinois, Farmer, went in as a private in August 1862, Co. H, 115th Illinois, mustered out June 1865 pursuant to general order." He marries Madie, and he lives a long life, until 1971, when he dies at age 85. The symbol is for the International Order of Odd Fellows. Was his father? Don't know. A Jesse Fisher dies at age 65. That would make his year of birth in 1824. 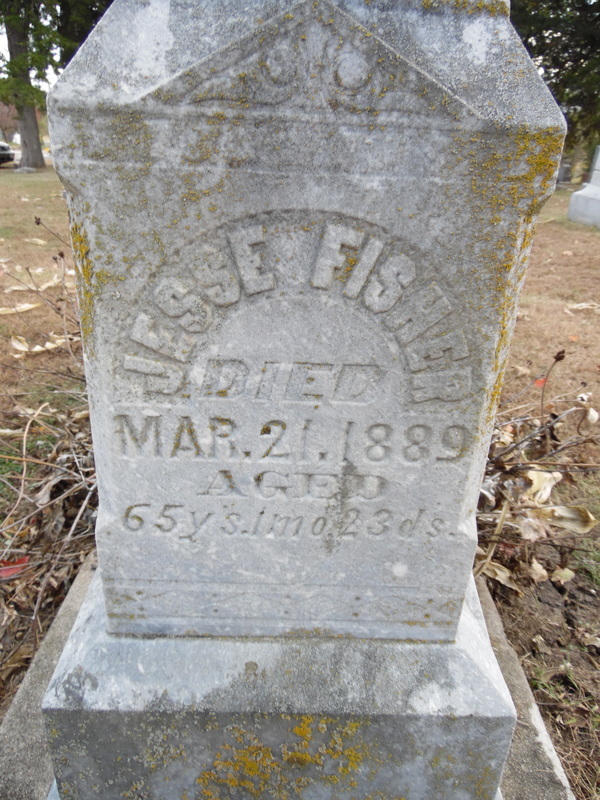 This cannot be the Jesse Fisher who was the Civil War veteran, for two reasons. First, the G.A.R. post records reflect that J. L. Fishber was 45 when he joined in 1885, i.e., he was born in 1845. Second, this Jesse would have been 38 in the year of enlistment, 1862. Perhaps this Jesse is a father or an uncle. 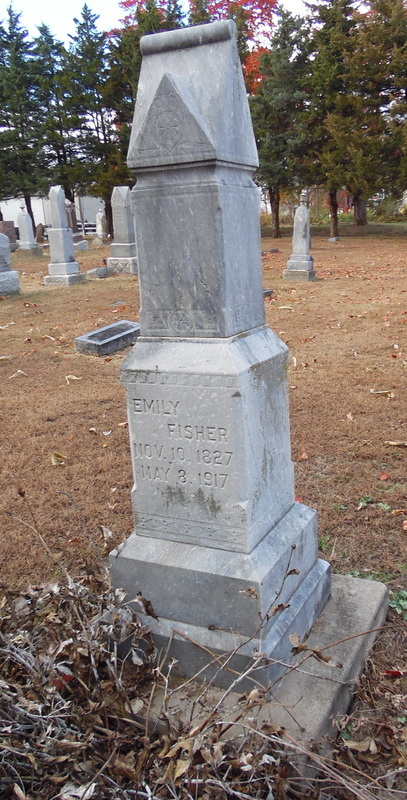 Buried with him and sharing the same tombstone is Emily Fisher, presumably his wife, as she was within a year of Jesse's age. She did not die until 1917, living to age 90. ﻿Ralph C. Clinton, was reportedly born in Tazewell County, Illinois in 1868, married Julia Carlock in1888, and died in Idaho in 1939. 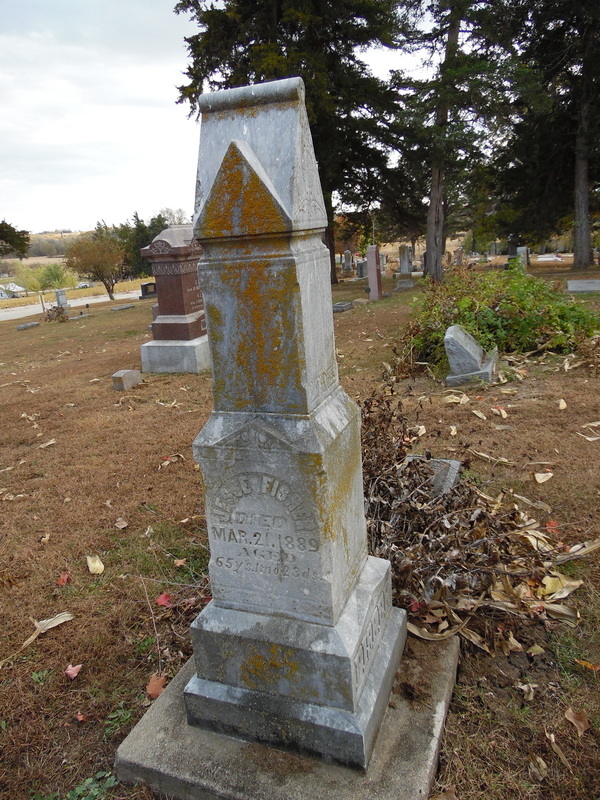 He and Julia are buried in the Table Rock Cemetery, as are their sons Everette and Ralph, Jr. Everette died at the age of 18 months. 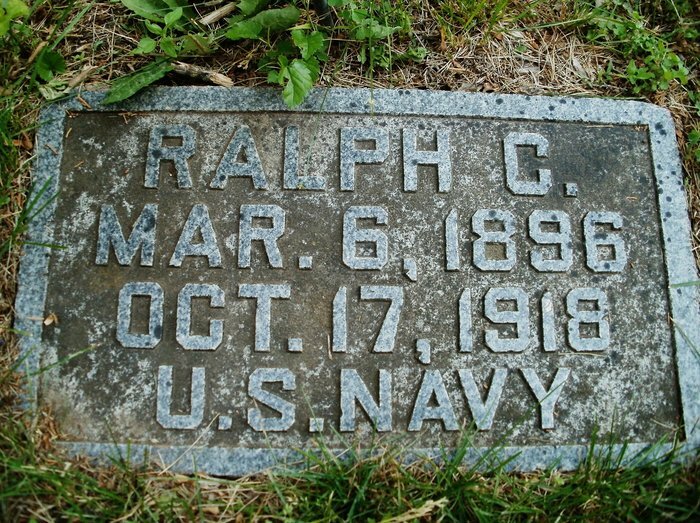 Ralph, Jr., died at 22 in World War 1. They had two daughters who lived to be old, the first and fourth children. 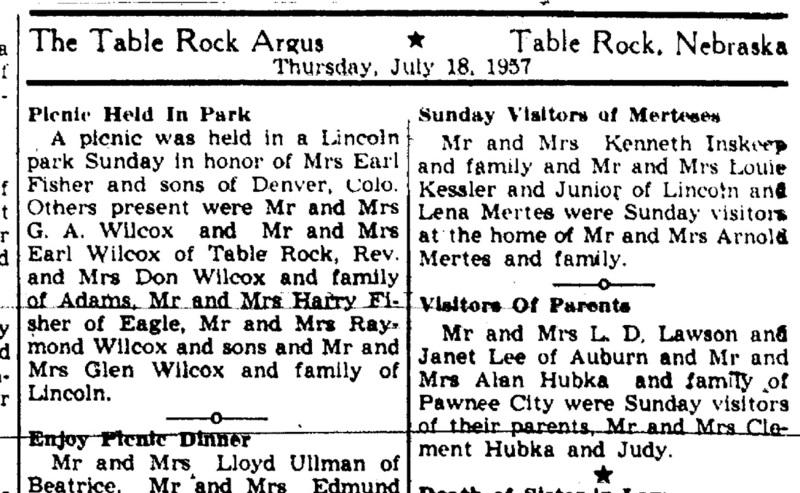 Ralph and Julia obviously lived in Table Rock at some point in between since their son Everette died here in 1892. 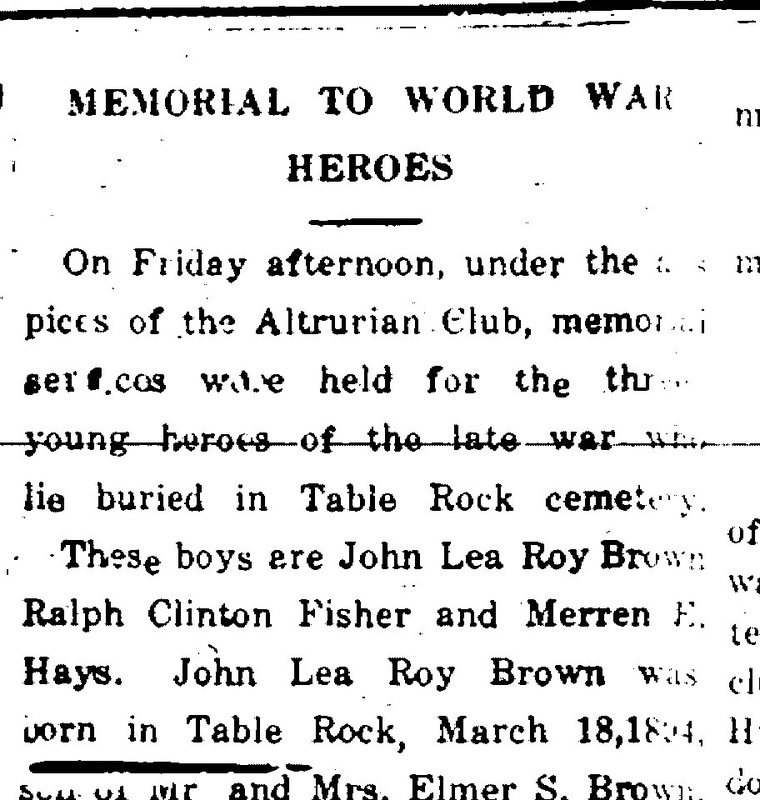 Their ties were deep, as they were living in Idaho when Ralph, Jr., was killed in the war, yet brought his body to Table Rock. And they themselves were brought back to Table Rock. 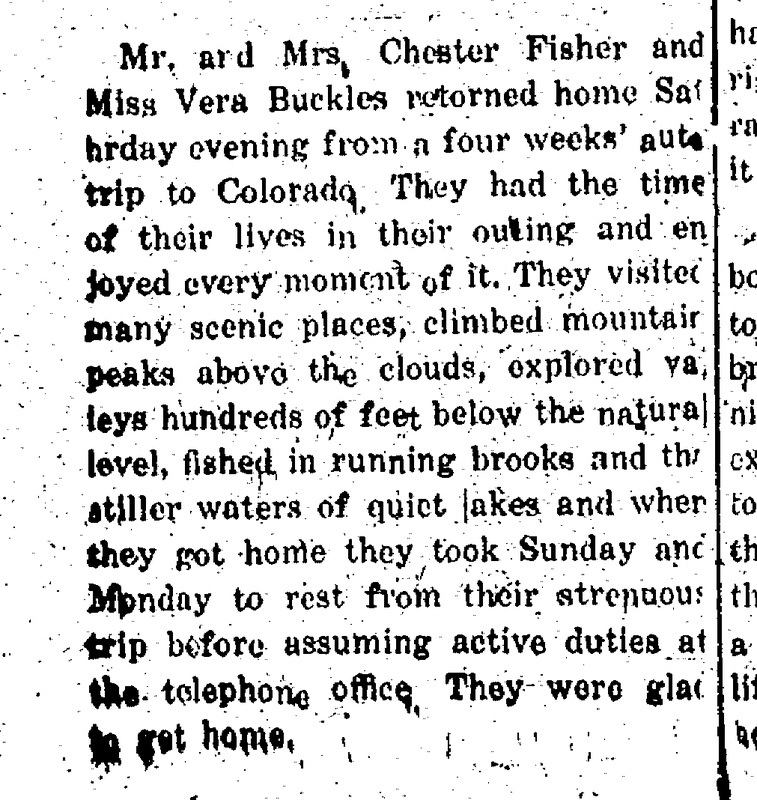 A Furnas County history (excerpted below) relates that brothers Lawrence and Dolph Fisher, children of J. L. and Losetta Harding Fisher of Table Rock, bicycled to the open prairies of Furnas County to see two of their brothers who had settled there, George and Jesse. The distance by modern roads is 234 miles. At the time, Lawrence -- known as Weddy -- was "barely a teenager." He was born in 1877, so the event probably was somewhere around 1890, when he was 13. The population of Wilsonville in 2010 was 93. This wedding picture from a Furnas County history book was shared by Cheryl Haakensen, along with the text history. 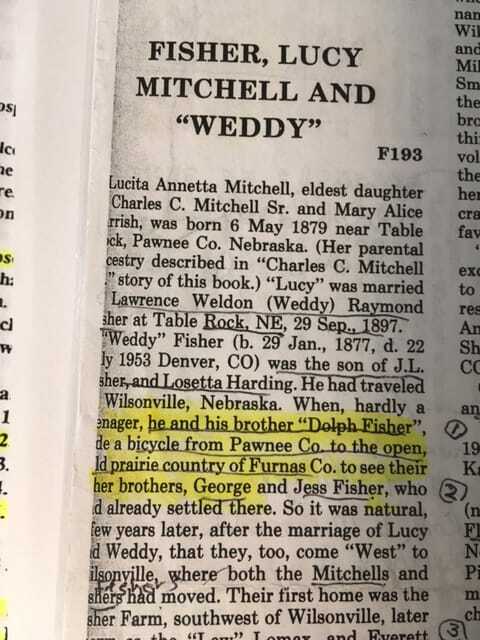 It is very interesting, relating that Weddy and his brother had bicycled from Pawnee County"to the open prairie country of Furnas County to see their other brothers, George and Jess Fisher, who had already settled there." A few years after their marriage in 1897, Weddy and Lucy moved there, too. The whole extended family came to rest in Wilsonville. This is Photo 1823, noted as being taken circa 1904. It is a gathering of Purcell family and friends. It is was shared with us by Terry Hunt Korell, a Purcell family descendant. 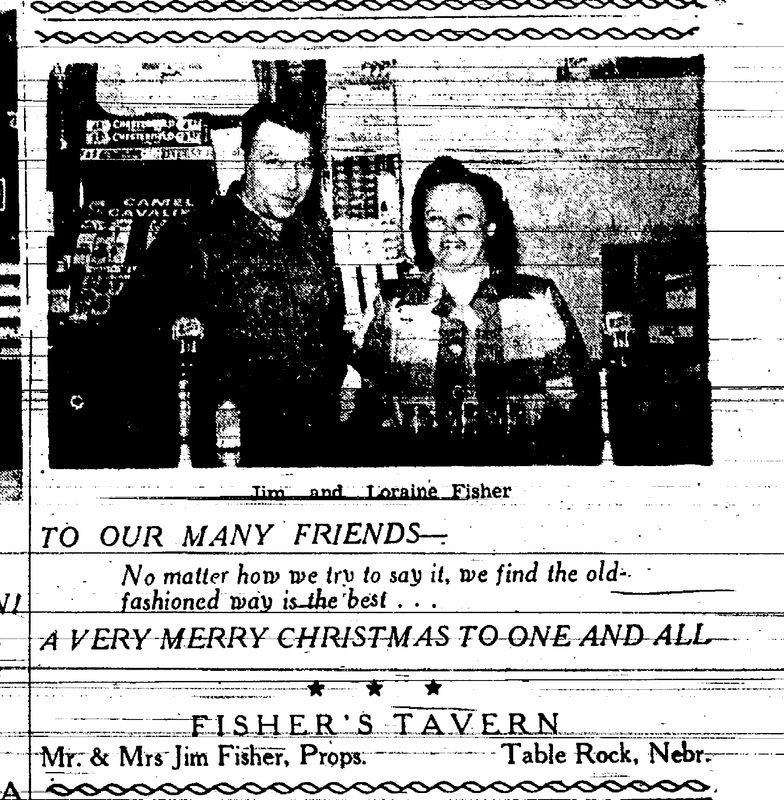 There is a young Chester Fisher and a "Mrs. Fisher," presumably his mother. Perhaps this is Emily Fisher. 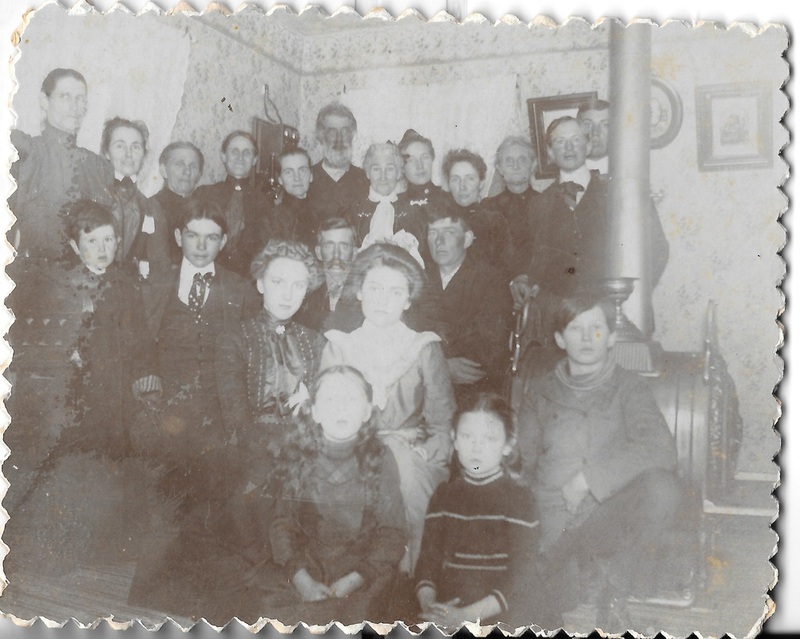 This is Photo 1823, shared by Purcell family descendant Terry Hunt Korell. it is a gathering of family and friends. Tom had gone ahead to locate a new home, leaving Helen and their two children in Table Rock. They had most recently lived in Auburn for several years, where Tom wass in the grocery business; he had sold out and taken a carload of goods with him. He left Helen and their two children with her parents, the J. L. Fishers. The funeral of Mrs. Helen Roberts was held on Saturday morning at 11 o'clock, the service being held in the Christian church, conducted by Rev. Eli of Joplin, Mo., who is holding evangelistic services at Pawnee City, and a large concourse of friends being present. The husband Thomas Roberts, who was in Alberta, Canada, where he was fitting up a new home, and was expecting his wife and two children to join him, was reached by telegraph, after considerable delay, and informed of his wife's serious illness, and he arrived in time for the funeral, but he did not know of her death until he reached Auburn on Thursday. Mrs. Helen Roberts died at the home of her parents, Mr. and Mrs. J. L. Fisher, in this city, on last Friday afternoon. The deceased was 35 years of age, and was united in marriage to Thomas Roberts about fourteen years ago. For several years past they have made their home in Auburn, where Mr. Roberts was engaged in the grocery business. A short time ago he sold out his business and with a car load of goods, went to Alberta, Canada to locate a new home, leaving Mrs. Roberts and the children here, until such time as he should get located. He had written to Mrs. Roberts to come, and she expected to start the next day after she was taken ill, but she rapidly grew worse, adn the husband was telegraphed for, but as he was a new man in a new country, forty-five miles from the railroad, and road in a bad condition, the messenger did not reach him until last Sunday; he started (unreadable) and is expected (unreadable). This great photo is Photo 163. It is undated. 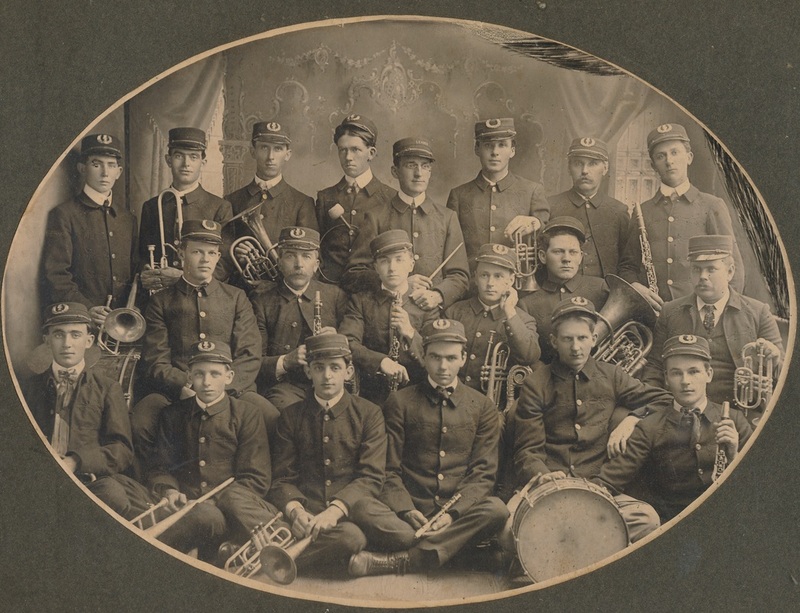 Chester Fisher is identified as being in the front row, the 5th man from the left. His hand is on a drum. 1906 - chester is friends with one of the "hello girls." The telephone operators were advertised as "hello girls" in those days. Here are Chester and some friends visiting hello girl Erma Mitchell at the telephone office. The office was above the bank. 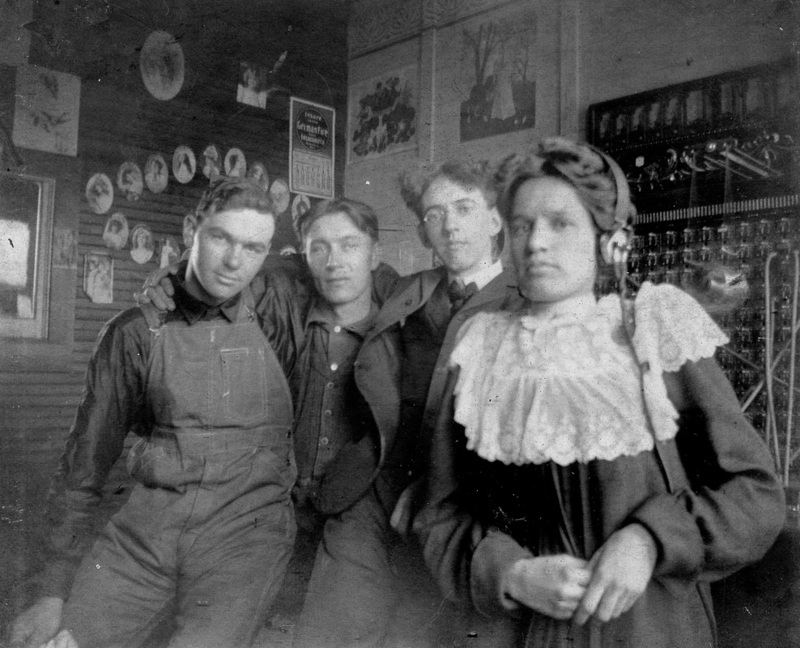 This is Photo 196, Erma Mitchell with Chester Fisher, Mylum Purcell, & Lou Billings. Labeling on the photo is not clear about who is who, but that looks like Chester on the left. The farm phone was 13. No house phone was listed. Follow the link to the 1913 telephone book, lots of stuff besides phone numbers! 1915 - chester fisher is in a czech band! He's the man with the drum in this photograph taken in front of the Moto-Drome that was apparently set up in Table Rock. The photo is dated 1915, Photo 177. Names are crossed out, and redone, apparently there was a discussion about who was who when this photo was donated. This is the final result. 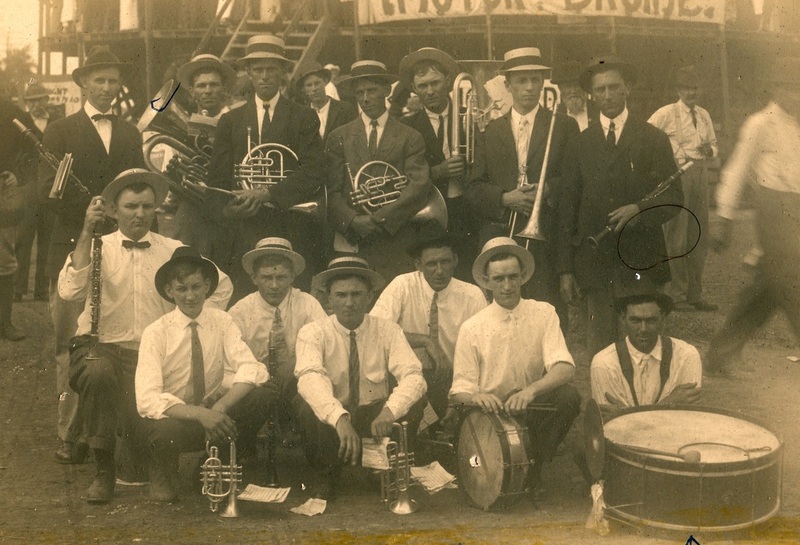 Front row: Joe Tomek, Frank Tomek, Jess Vondrasek, Emil Rabstejnek, Arnold Petrasek, Earl Irwin, and, withy the drum, Chester Fisher. Back row: John Tomek (one comment says Fred), Tom Krofta (one comment says Rudy Kalina but it is Tom Krofta), Art Krofta, Charles Rabstejnek, Ralph Cotton, Charles Klaine, Otto Vondrasek. She is buried with her husband. She was 90. 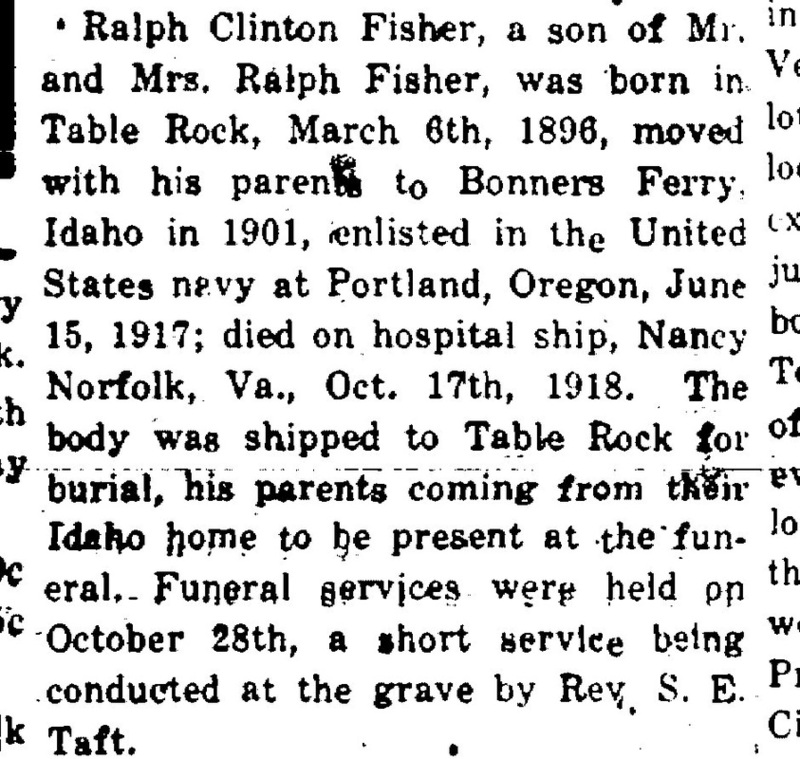 Ralph died on a "mercy ship" (transporting the sick and wounded" of the "Spanish" flu, which is a flu that reportedly actually originated out of Ft. Riley, Kansas. 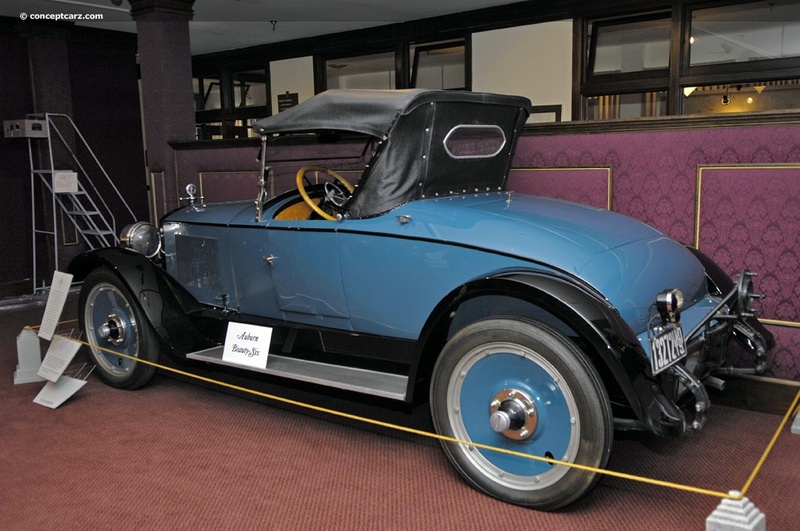 An Auburn Beauty Six, by the Auburn Automobile Company of Indiana. This is an original car. The article does not say what color Chester's car was. 1921 - memorial services are held for three who died in the "late war," including Ralph fisher, jr.
Chester & Madie would have been in their mid-40s. This Fisher family is related to the Wilcox family. Historical Society member Earl Wilcox of Table Rock brought a nephew Larry Fisher to visit the museums in the summer of 2014. 2014 - larry fisher visits the table rock museums! On a hot summer afternoon, Earl Wilcox brought two of his nephews by for a visit. They had apparently all attended a Wilcox reunion. One was Larry Fisher of Idaho. His mom graduated from Table Rock in 1937. Larry's Fisher side probably has no connection to Table Rock, but Larry is nevertheless a Fisher, so I include him on this Fisher page to honor his visit! While here, Larry and his cousin helped crank up an old Victrola that was sitting backstage at the Opera House. There is no electricity in that building, but for a while there was music.